When I was little I would watch Anne of Green Gables and Little House of the Praire all the time with my little sister. When I moved about I also watched them with my hubby and now that I have kiddos I watch them with my boys. Both shows are classics and timeless and I have a feeling in 25 years I will be watching them with my grandbabies. Based on the acclaimed best-selling series by L.M. Montgomery and starring Emmy® and Golden Globe® Award-winning Martin Sheen (“Apocalypse Now”, “The West Wing”), come the next set of adventures for beloved Anne Shirley. As Anne turns thirteen she faces a host of new milestones: first sleepovers, culinary misadventures, and shifting relationships with her bosom friend Diana and academic rival Gilbert Blythe. Through all this, Anne strives to strike a balance between becoming an upstanding, sensible young woman, and embracing her inquisitive and free-spirited nature. With returning cast members Sara Botsford (The Fog) as Marilla Cuthbert and Ella Ballentine (The Captive, The Calling) as Anne Shirley. 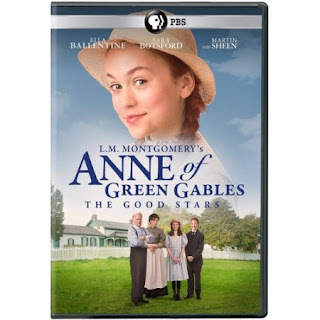 “Anne of Green Gables: The Good Stars” has a run time of approximately 90 minutes.